If your main priority is to stay close to the Langkawi Airport, then there is no other hotel which is closer than this one. Hotel Helang is almost adjacent to the airport building and only 5 minutes walk from airport's arrival hall exit. So if you are carrying light luggage, you can easily pull your trolley bags up to the hotel. You don't need to hire a taxi. This is the first hotel to get full during the Langkawi Air Show Exhibition (LIMA), a biennial event that takes place at the Mahsuri International Exhibition Center close to the airport. Most guests and visitors coming for the air show stay at this hotel for sheer convenience. But even otherwise, if you want to stay a bit away from the crowded places, and at the same time be conveniently placed with easy access to several great attractions in the island including Pantai Cenang Beach which is just 10 minutes drive, then this hotel can be a good choice. The relatively new and large property offers 3-star amenities and comfort. 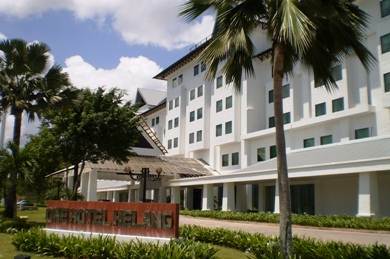 Hotel Helang has 218 rooms of several categories - Deluxe King & Queen rooms, Deluxe & Executive Suites. The Deluxe Queen rooms have two queen size beds and is great for small families. You get two large beds in a single room. The Deluxe King Room has a single King Size bed and great for a couple. Both types of rooms are 480 sq feet in size and quite spacious. The suites are larger (1000 sq feet) and have separate bedroom and living room. They have additional amenities like slippers, water bottles, face towels, electronic safe box etc. Almost all rooms have been recently renovated and refurbished. Most guests prefer rooms that face the airport runway and you can see aircraft taking off and landing from your room. Although sound proofing has been done in most rooms, the sound of the aircraft can still be clearly heard and that's one problem that you may need to live with if you stay in these rooms. The other rooms are either facing the pool or the road. There is a nice garden in front of the property and many rooms overlook that lush garden. So while checking in, if you have a preference with views, ask for one that you like. The staffs are cooperative and friendly enough to accommodate that. All rooms have standard amenities like air conditioning, flat screen TV, IDD phones, tea & coffee maker, mini bar, internet access etc. All bathrooms have bathtubs with separate shower cage. The swimming pool is large and really great. It's surrounded by coconut trees and plants, and has nice lounging areas with lounge chairs and umbrellas. If there is one best thing that I have to point out about the hotel, it is this 540 sq meter lovely pool. It's open from 8aam to 8pm. The hotel also has a children's pool. Other amenities in the hotel includes car parking, baby sitting service, Tour Desk, Gift & Souvenir Shop, Pool Tables, dart boards etc. The Eagle Lounge has nice selection of English, Malay and other music just in case you like karaoke. The Garuda Ballroom can be booked for private functions. It accommodates 600-700 persons. The internet center is located at the lobby offering high speed connectivity. Although Hotel Helang itself has no beach access, it offers free shuttle service to its sister hotel Four Points by Sheraton which has a lovely private beach. From there you can soak in the amazing view of the sunset and have casual fares. The poolside Lobby Terrace Restaurant is located adjacent to the pool. It has both indoor and open air seating. It offers Asian and Western cuisine and serves breakfast and other meals. It has a bar serving spirits and other beverages. The hotel location which is right adjacent to the Airport. 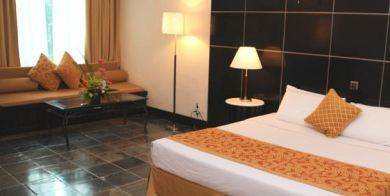 The rooms are specious and bathrooms are large enough. The swimming pool is lovely and full size. Cleanliness is an issue. The corridor smells at times and the service elevator is often kept unclean. You can sometimes see unclean plates kept outside and not removed in time. Breakfast is inadequate and lacks variety. In fact overall the food served in the hotel is not of great taste. We prefer to eat outside. Either take a car and go down to Pantai Cenang where there are ample restaurants of all types, or just walk down to the airport duty free hall... there are couple of cafes like Starbucks and Marry Brown. You will need a transport to get around. Either call for a taxi or have a rented car. Otherwise you will be confined to the hotel. There is nothing within walking distance. 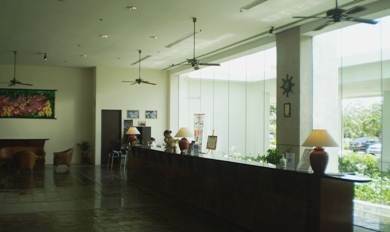 The hotel is located adjacent ot Langkawi Airport and takes only 5 minutes by walk. 1) Padang Matsirat Guide: Hotels, restaurants, shopping, nightlife & activities in the area.